"Feng shui rules," says a character in the Hollywood comedy The Other Woman. Though the feng shui consultant's line came in an argument over men, it is now proving to be prophetic across the US real estate market, as shoppers for everything from condominiums to cemeteries want the input of the ancient metaphysical art of channeling positive energy. Houses are being decorated based on feng shui, according to John Pan, associate real estate broker with Daniel Gale Sotheby's International Realty. Instead of having a house's address end with the numeral four (which sounds like "death" in Chinese), home owners try to have their address changed so that it ends with the number eight (which sounds like "getting rich" in Chinese). "It is not only a plus," said Pan, "it's a key element to push some of the products, especially in areas where there's a strong interest from the Chinese population." In Sky View Parc, a landmark real estate project in Flushing, Queens, the retail space is designed to be 80 feet high, with the first floor of condominiums above starting on the 8th floor. A 14th and 24th floor are omitted from the project, along with a 13th floor. 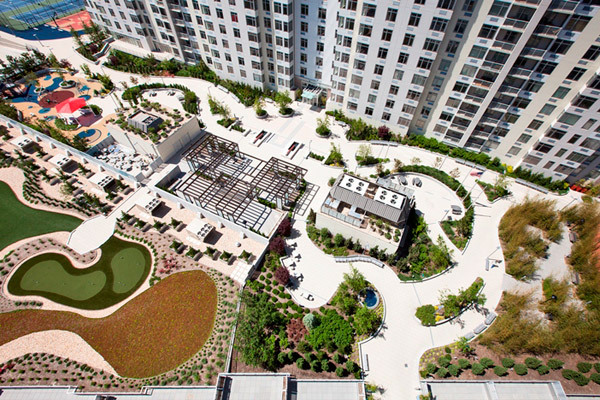 The roof of the Sky View Parc is a garden, laid out with a feng shui consultant. Colors of all structures have been designed for "the orientation of positive energy", and the entrances to the courtyards are mapped out for the flow of energy. ‎David Brickman, vice-president of Onex Real Estate Partners, developer of Sky View Parc's second phase, agreed the use of feng shui was largely to attract Chinese buyers. Chinese are the largest group of foreign buyers of real estate in 46 of the 50 states, according to the National Association of Realtors and Juwai.com, an online marketplace for Chinese property shoppers. The association said the Chinese spent $22 billion on US real estate in the 12 months ending in March 2014, and 76 percent of it was all-cash transactions. Many business people from China are so into feng shui that they have become experts in it themselves. "They believe feng shui goes hand-in-hand with their success," Pan said. Feng shui, meaning wind and water in Chinese, goes back thousands of years. "With an emphasis on promoting balance, simplicity, harmony and flow, feng shui is definitely an important tool in the design and staging industry," said James Hart, principal of Sold With Style, a premier interior staging company in Manhattan. "I don't think you have to believe in or even be aware of the elements of feng shui in a design to appreciate the tranquility that it imparts upon a space," he said. Interest in feng shui has not only reached beyond the borders of Chinese communities, but also across the border between life and death. "Feng shui principles cross all ethnic and religious boundaries," said Bruce Lazenby, executive director of business development at Rose Hills Memorial Park and Mortuary in Whittier California, whose design is based on feng shui principles. "People are intuitive. They don't know about feng shui but they can appreciate the good design." Around two fifths of Rose Hills' clients are Asians. In Fairhaven Memorial Park and Mortuary in Santa Ana, California, where only five percent of the clients are Asians, terraces are still built to feng shui principles. A rolling landscape, as opposed to a completely flat one, is considered more auspicious. "In the past four years, I have seen more people who I never thought would think about feng shui actually now starting to ask me questions," said Franca Giuliani, a feng shui teacher with New York Institute of Art + Design. Guiliani teaches around 100 students each year via the Internet. Some of his students are designers who want to have an advantage in the job market, while some are just interested. "People are very open to feng shui in general. People like alternatives, just like for a form of medicine, they do yoga," said Peggy Fucci, president and CEO of OneWorld Properties, a Miami-based brokerage focused on high-end new construction condo developments. "A lot of people are staying away from conventional things and going to more things that are just different. They can enhance their lives without having to spend enormous amounts of money," she said. "It just makes them feel good." Lu Huiquan in New York contributed to this story.